Coffee and tea stains? Yellow stains caused by smoking? This teeth whitening treatment may be the best treatment for you. The Luster 1-Hour Tooth Whitening Treatment claims to whiten teeth up to 6 shades in an hour. This new home teeth whitening treatment uses a whitening light system that activates the bleaching chemicals applied on the teeth. Step 1: Brush and floss. Step 2: Rinse with the Accelerator Mouth Rinse. Step 3: Apply the Whitening Gel to your front teeth the way you would nail polish. Step 4: Once the polish is set, turn the Whitening Light on, and hold in front of your teeth for two minutes. It automatically shuts off after 120 seconds, so you don’t have to count. The outer edges of the light have a rubber shell, which makes for a much softer grip if your facial muscles give out and you want to hold it in your mouth. Step 5: Repeat the treatment 20 times and see the results. Try the newest teeth whitening treatment available today. 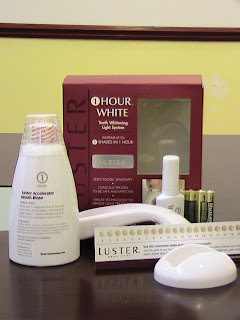 Try Luster now!